1943 - German SP Light Field Howitzer 10.5cm "Wespe"
The Wespe (Wasp) was the best known German SP artillery vehicle of WWII. It was chosen as the most practical SP mount for the leFH18 howitzer. Proved to be a great success. 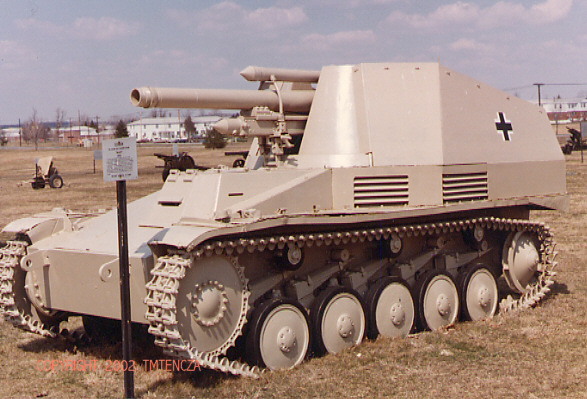 After 1943, all PzKpf II chassis were used for its production. Chassis was modified; engine moved forward, suspension was altered. Fighting compartment was built up with sloping plates. First major action was at Kursk. It served until the end of the war. Over 683 built.